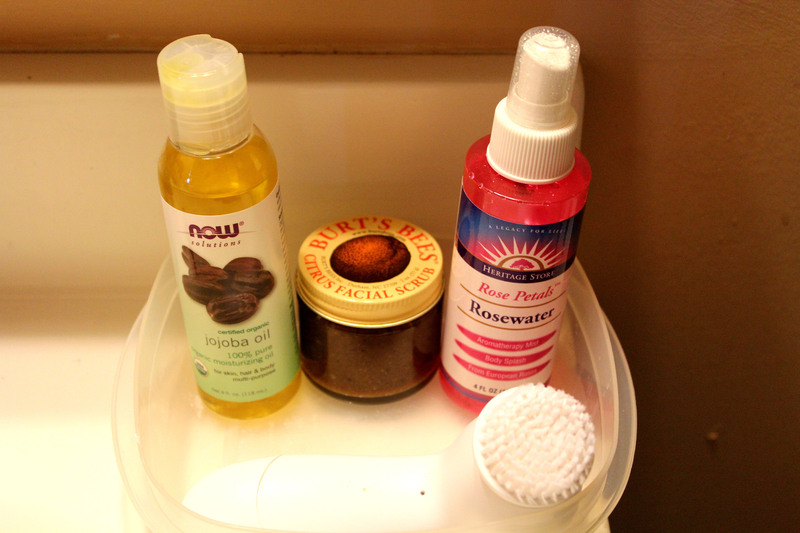 During the summer months my skincare routine is relatively basic and does not contain a lot of steps or products. There is nothing worse than having thick face products on your skin when your hot and sweaty!! It’s better to keep it simple! Cleanser and Makeup Remover all in one. For this I love to use Jojoba Oil as it not only removes makeup extremely well and is hypoallergenic so it won’t irritate your eyes(it’s perfect for removing mascara and eye makeup!) or face but it also is a wonderful deep cleansing treatment and leaves your face feeling baby soft!! Exfoliate, don’t irritate! I love Burt’s Bees Citrus Facial Scrub. I have been an avid user of this scrub for years but just recently brought it out and started using it again. It has never irritated my skin or left it looking red or feeling dry after using it. I love how it smells (it reminds me of pumpkin pie!) It does a great job at removing any makeup that may have not come off previously after cleansing and it removes dead skin and also does a great job of clearing up breakouts and leaves your face feeling so soft! I also love to break out my Olay Pro-X Facial Brush anywhere from 1-2 times a week (depending on how my skin is) and for this I like to use a few drops of oil (Jojoba or Argan Oil) and lather it on my face and then use the Olay Brush to get a really deep exfoliation. It doesn’t irritate my skin at all and I find that using it a few times a week is enough for me! I SWEAR by Rosewater and Glycerin. I mix in two tablespoons of Glycerin into my bottle of Rosewater spray and I spritz this on my face morning and night after cleansing and exfoliating. It works as both a toner and a moisturizer in one. I find that I don’t even need to use any other moisturizer or cream when I spray this on my face because it seals in all the moisture and lasts all night. It gives my face the most amazing, natural glow ever. I love this stuff so much!!! Last but not least I like to use a light eye cream at night and in the mornings when I have not had enough sleep or have simply not been feeling well and it starts to show in my dark circles!!! I like very light eye creams that don’t feel sticky or heavy. My two favorites at the moment are the 100% Pure Organic Coffee Bean Eye Cream (smells delicious!!!!! 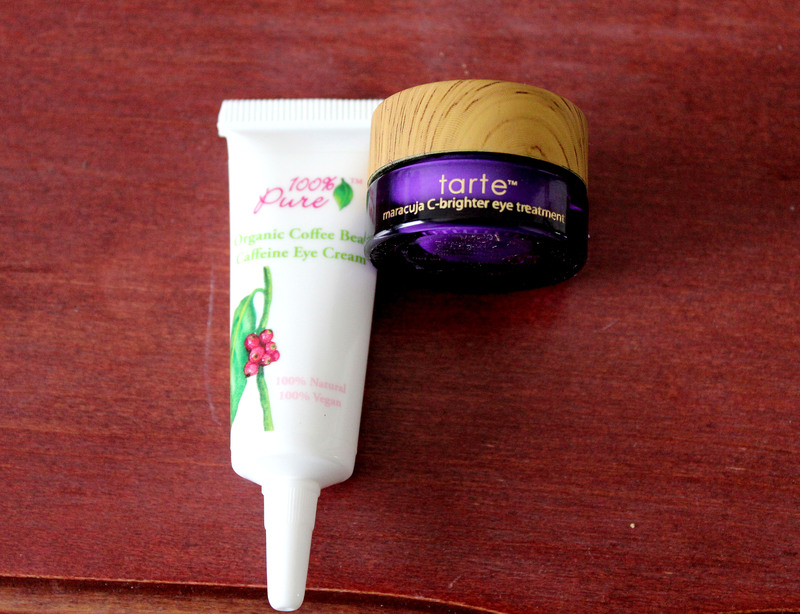 works at decreasing puffiness and wrinkles) and Tarte Maracuja C-brighter Eye Treatment (perfect for dark circles and brightening up the under eye area). Both of these work really well at night and in the morning and I find that makeup layers really well over both. What are your summer face essentials?